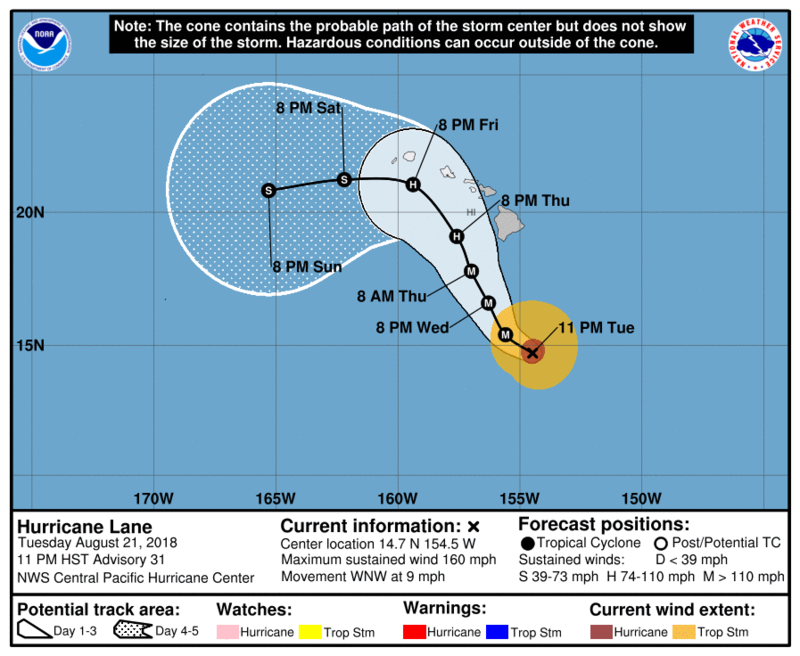 Interests elsewhere in the main Hawaiian Islands, and across the Northwestern Hawaiian Islands, should continue to closely monitor the progress of Hurricane Lane. Additional Tropical Storm or Hurricane Watches or Warnings may be issued tonight or Wednesday. 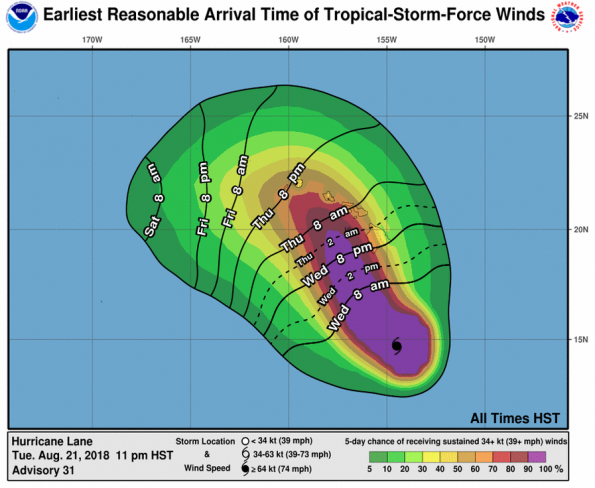 At 11 p.m. HST (0900 UTC), the center of Hurricane Lane was located near latitude 14.7 North, longitude 154.5 West. Lane is moving toward the west-northwest near 9 mph (15 km/h) and this motion is expected to continue tonight. A turn toward the northwest is expected on Wednesday, followed by a turn to the north-northwest on Thursday. On the forecast track, the center of Lane will move very close to or over the main Hawaiian Islands from Thursday through Saturday. Maximum sustained winds are near 160 mph (260 km/h) with higher gusts. 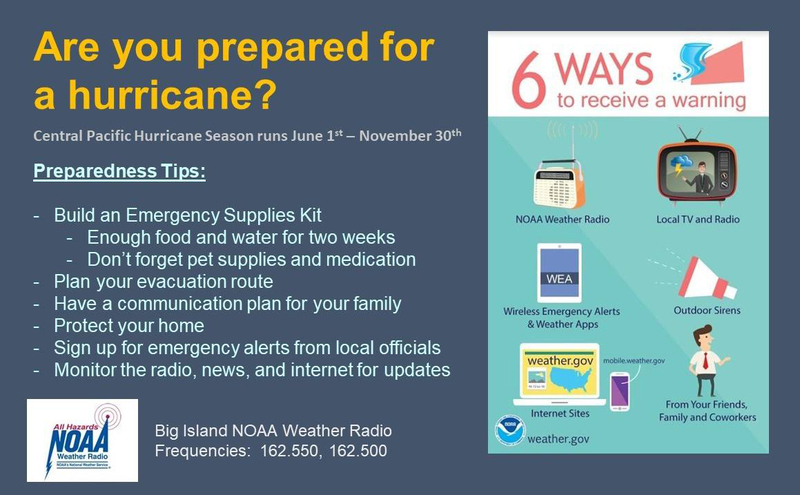 Lane is a category 5 hurricane on the Saffir-Simpson Hurricane Wind Scale. Slow weakening is forecast during the next 48 hours, but Lane is forecast to remain a dangerous hurricane as it draws closer to the Hawaiian Islands. This is a Civil Defense hurricane update for 7:15 p.m., Tuesday, August 21, 2018. All County of Hawaii offices are open for normal business hours tomorrow. All public schools and the University of Hawaii campuses will be closed until further notice. All beach parks, from South Point north to Kohala, will be closed until further notice. All pavilion and camping permits for these parks have been cancelled. South Point Road from the Kamaoa Road junction to South Point is closed to all traffic. The Division of Boating and Ocean Recreation (DOBOR) advises all boat owners in unprotected harbors from Milolii to Mahukona to take all measures to secure their vessels. This includes removal, if possible. Complete all actions before nightfall Wednesday. The Department of Education, in coordination with the American Red Cross and Hawaii County Parks and Recreation, have identified shelters in all districts that will be opened if necessary. You will be notified if any of the shelters are opened. Civil Defense is monitoring Hurricane Lane and will keep you informed of any changes that may affect your safety.